Lots of times at My Name Is IRL we sit around and lament the, uh, contributions of Gene Simmons to the Indy Racing League. You’d think a guy who has been successful as both a rockstar and an entrepreneur would be beneficial to the league, but so far this relationship doesn’t seem to be helping anyone except The Tongue. He gets paid, he gets exposure, and all we fans get are mostly static ratings and the Mindy Song. Such a deal. I don’t know, maybe PJ Chesson benefits from this. Maybe. So as annoying as The Tongue can be, his faults are even more obvious when you compare him to another famous rocker who has had success away from the stage. After signing on as co-owner of Team KMA of the Indy Pro series, Sammy Hagar has done more than Simmons himself has seemed willing to do: that is invest his own money in the sport. Now you may not think of Hagar as a major presence in IndyCar racing, but the reality is he may become one very soon. 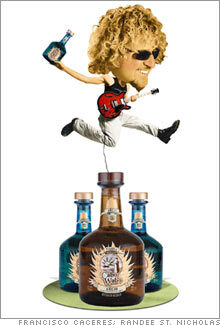 In May Hagar sold an 80% stake in his Cabo Wabo Tequila business for $80 MEEELLION. He probably doesn’t want to spend it all on race cars, but with change like that in his seat cushions he can afford the hobby for as long as he likes. Couple this financial success with Hagar’s passion for the sport and you can see the Red Rocker may soon become a major player. Listen to how Hagar recounts his reaction to the win in Nashville by KMA’s Robbie Pecorari. Pecorari's first win of the season in July at Nashville, Tenn., was a welcome wake-up call for Hagar, who happened to be in Italy at the time. The reason for mentioning this now is that this weekend Hagar wasn’t just watching his Indy Pro team – he was hanging with AJ Foyt in the Foyt Racing garage. While the Foyt team has regained some respectability with the addition of Darren Manning this season, it’s no secret they would like to continue their progress by adding a second car. Oh, and did I mention that Cabo Wabo is already an associate sponsor for Foyt’s #14? Yes, AJ and his crew seem to be fired up about seeing Sammy as well. So the positives from the race were that our ABC Supply crew continued to have good pit stops — all of which were under green. Speaking of the pit crew, the back of their uniforms sported patches featuring some of Sammy's hit songs like I Can't Drive 55, One Way To Rock,Mas Tequila, Dreams and Right Now. Is it love for Sammy? Is it begging for dollars? Probably both. Remember that when an IndyCar team has an affiliation with an Indy Pro team they get extra practice, and as any driver will tell you those extra laps during the season are a significant advantage for any given race. Foyt has no such affiliation and neither does Team KMA, so even the simplest of deals could benefit both teams. And while there are no promises of how much additional coin Sammy is willing to invest in Team KMA or Foyt Racing, it’s a heck of a lot more encouraging to see a celebrity with pockets full of cash excited about promoting the racing instead of pimping himself. Anything or anyone that helps Manning out is okay in my book.